Exfoliative keratolysis is a skin condition where there is frequent focal skin peeling on the palms of the hands, the surface of the fingers, and, less often, on the soles of the feet. This painful or harmless skin problem also goes by names such as keratolysis exfoliativa, lamellar dyshidrosis, dyshidrosis lamellosa sicca, and recurrent palmar peeling. Often misdiagnosed as psoriasis, eczema, or chronic contact dermatitis, exfoliative keratolysis is more common in children and young adults, in those with sweaty hands, and during the summer months. The condition often causes air-filled blisters that eventually peel, and leaves the skin looking reddish, tender, dry, and cracked. When it comes to exfoliative keratolysis treatment, although moisturizers help, more advanced skin therapies may be needed to fully relieve symptoms. Also, keep in mind that exposure to soaps and detergents will make exfoliative keratolysis worse. Want to know more about exfoliative keratolysis? This article will detail everything you need to know about exfoliative keratolysis causes, symptoms, treatments, natural home remedies, and tips to prevent the condition. How Long Does Exfoliative Keratolysis Last? When your hands are covered in ruptured blisters, the first thing you want to know is the cause of this irritating skin condition. Unfortunately, what causes exfoliative keratolysis is relatively unknown. That being said, there are certain scenarios that make someone more susceptible to exfoliative keratolysis. First, let’s take a look at how the outer layer of the skin, the epidermis, is involved in the development of exfoliative keratolysis. The epidermis is made of several layers of keratin—a protein necessary for skin strength and flexibility. When keratin breaks down, it impairs the skin’s strength and elasticity. In turn, the loss of strength causes the skin to exfoliate. However, the cause of the constant skin shedding in exfoliative keratolysis remains a mystery. At the same time, several factors can lead to the skin peeling associated with exfoliative keratolysis. Soaps and detergents: The chemicals in soaps, detergents, and solvents can lead a person to develop cracks and blisters on their hands due to an allergic reaction. Allergies: The condition can be triggered by skin asthma due to environmental factors, such as food, air pollution, and other substances. Stress: The onset of exfoliative keratolysis can be triggered by stress. Also, if the condition is already an issue, stress can continue to aggravate it. Hot summer months: The weather has a great impact on the body, especially the skin. Extremely hot climates during the summer can increase sweating, and this can stimulate keratin breakdown and result in peeling and exfoliation of the skin. Saltwater exposure: Reports among fishermen indicate that both prolonged saltwater exposure and the bacteria on sea creatures contribute to the skin peeling related to exfoliative keratolysis. Dry skin: There is a risk of exfoliative keratolysis when the skin is dry due to the weather, health issues, or taking certain medications. One of the first key exfoliative keratolysis symptoms is air-filled blisters that later peel in a circular pattern, or split and form skin tags. The palms of the hands, the tips of the fingers, and soles of the feet are the most often affected areas. The formation of numerous skin tags will look like the skin from the hand is peeling. The peeled skin from the fingers and fingertips is often harder due to constant peeling before healing takes place. After bursting, hand blisters will leave scales that look cracked and reddish. The scales are also tender and dry after the skin has peeled off. Blisters that form and split at the base of a finger often have deeper cracks that later make the skin feel numb and hard. Exfoliative keratolysis at the finger’s base will often take longer to heal due to frequent skin peeling. Normal skin gradually develops as the blisters split and new skin forms. However, exfoliative keratolysis will recur several weeks after skin appears to return to normal. Although exfoliative keratolysis is often painless and relatively harmless at times, the appearance of peeled skin may lead to embarrassment and depression. While eczema and exfoliative keratolysis look very similar, the difference is that exfoliative keratolysis will peel and shed, whereas eczema also produces itchy skin. Exfoliative keratolysis creates air-filled blisters, while eczema creates fluid-filled blisters. Eczema is also a quite painful condition, whereas exfoliative keratolysis doesn’t hurt as much. For an accurate diagnosis of exfoliative keratolysis, a negative result from a patch test is required. So, how long does exfoliative keratolysis last? There is no definitive cure for exfoliative keratolysis. As a result, the condition will recur since the root of the problem does not get addressed. Exfoliative keratolysis treatment is available; however, the treatment is more of a palliative solution. In other words, treatment can only deal with the symptoms and signs associated with the condition. Exfoliative keratolysis will hibernate beneath the skin once the redness and scales have healed. Still, it will reappear weeks and even months later. When this is the case, it is best to consult your doctor for exfoliative keratolysis treatment. But, treatment is best during the early episodes. Therefore, management of exfoliative keratolysis may still be limited, and treatment is quite difficult. The best exfoliative keratolysis treatment is to avoid factors that cause the condition, including irritants like soaps, solvents, and detergents. It is also a good idea to avoid the warm weather during the summer, since this can lead to skin peeling that may eventually develop into exfoliative keratolysis. Also, be sure to clean your hands to keep bacteria from getting inside the cracks on your hands and fingers. In addition, exfoliative keratolysis treatment will include topical steroids and cortisone creams; topical emollients that contain lactic acid, silicone, and urea; photochemotherapy; and a number of home remedies and natural treatments. Let’s take a deeper look at some of the other exfoliative keratolysis treatments available. Applying lactic acid hand cream to the skin is one of the more common exfoliative keratolysis treatments. Often times, these creams also contain silicone and urea. Urea is a natural moisturizing factor found in the outer epidermis. The hand cream can prevent the excessive scales and dryness that lead to peeling from forming. It can also fortify the epidermal barrier that may prevent future exfoliative keratolysis outbreaks. Ultraviolet radiation treatment is also called photochemotherapy (PUVA), and uses ultraviolet rays to treat exfoliative keratolysis. This process also involves the application of psoralens—plant compounds that include trisoralen, 5-methoxypsoralen, and methoxsalen. PUVA ultimately serves as a last-resort treatment when exfoliative keratolysis becomes too severe. Although PUVA can be effective, it can also have various side effects, like itching, burning, eye damage, and skin cancer. Natural hand soak: Soak your hands in an oatmeal bath for about 15 to 20 minutes daily to help improve exfoliative keratolysis symptoms like dry skin. To enhance improvement, add a few drops of anti-inflammatory essential oils to the hand bath. Some effective essential oils include ginger oil, clove oil, myrrh oil, lavender oil, and frankincense oil. Natural moisturizers: Since dry skin is both a symptom and cause of exfoliative keratolysis, it is important to moisturize the affected skin at least twice each day. Coconut oil is the best natural moisturizer due to its antimicrobial, antifungal, and antibacterial properties that may speed healing and soothe the skin. Plant-based applications: Try making a natural homemade exfoliative keratolysis cream with raw honey, shea butter, and coconut oil. The application of cucumber juice, aloe vera gel, witch hazel, or pineapple juice can also help improve exfoliative keratolysis. How can you prevent exfoliative keratolysis? There are a number of preventative tips that can help you decrease the risk of exfoliative keratolysis symptoms. Avoid certain bathroom products: Stay away from products with substances that may contribute to exfoliative keratolysis, including solvents, antibacterial soaps, and certain fabrics. Eat the proper diet: It is best to eliminate processed foods and additives, fried foods, high-sugar foods, and common food allergens from the diet. Instead, eat plenty of anti-inflammatory, essential fatty acid-rich foods like flaxseed oil and wild-caught fish, and other foods that assist with wound healing like vitamin A-rich foods, probiotic-rich foods, and pumpkin seeds and chia seeds. Proper hand hygiene: Maintain hygiene with frequent cutting of your toenails and fingernails. The hands and feet should also always be well cleaned. This can ensure that exfoliative keratolysis will not be exacerbated by secondary infections. When it comes to skin conditions, exfoliative keratolysis is, at times, harmless but also sometimes quite painful. The skin peeling associated with the condition can affect the palms of the hands, the tips of the fingers, and even the soles of the feet. There is no definitive cure for exfolaitive keratolysis; however, the right treatments can help control symptoms of the condition, such as lactic acid application, ultraviolet radiation treatment, or home remedies like certain essential oils or a coconut oil moisturizer. It is also wise to eat a healthy anti-inflammatory diet and maintain proper hygiene by cutting your nails on a regular basis and washing your hands and feet. If you are struggling with exfoliative keratolysis or another skin condition, visit a dermatologist or a natural health practitioner familiar with skin problems to learn more about the best treatment approaches available for you. Oakley, A., “Exfoliative keratolysis,” DermNet New Zealand; https://www.dermnetnz.org/topics/exfoliative-keratolysis/, last accessed Jan. 18, 2018. 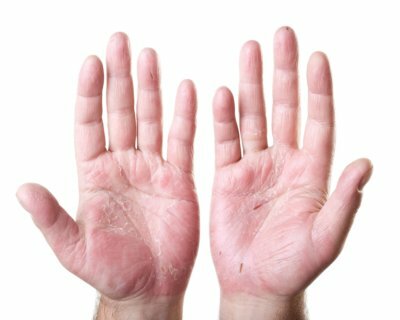 “Natural Eczema Treatment: 13 Home Remedies for Eczema,” Dr. Axe; https://draxe.com/eczema-treatment/, last accessed Jan. 18, 2018.